Styled with nicolas sweater , kirke pant and cuffed leather glove . 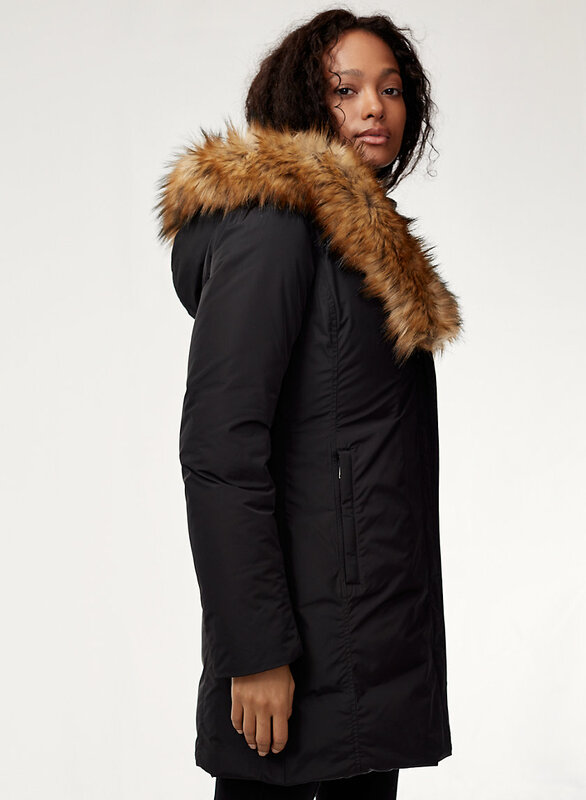 Engineered to deliver warmth to -30°C / -22°F, the Julian’s sleek, feminine silhouette is made with a water-repellent and windproof fabric that helps prevent it from becoming saturated in wet weather. It’s filled with 100% responsibly sourced goose down, while merino wool-blend cuffs add an extra dose of coziness. Wow! Good fit . Love the color and style . Fits a bit bigger. I’m usually an XXS but I got an XS. Could be a little tighter, but it’s really warm and comfy. It is warm and really nice but a lil bit larger for me, i should take xs. Bought this parka a few weeks ago as substitute to my Canada Goose parka for nasty New York's winter weather (rain, wet snow, wind). I like the color (bordo), like the fur and material, like the size - fits perfectly. It is not very heavy for winter coat. It is warm though we didn't experience freezing temperatures in NYC this year. The hood stays up despite crazy winds and I don't need to wear hat at all. 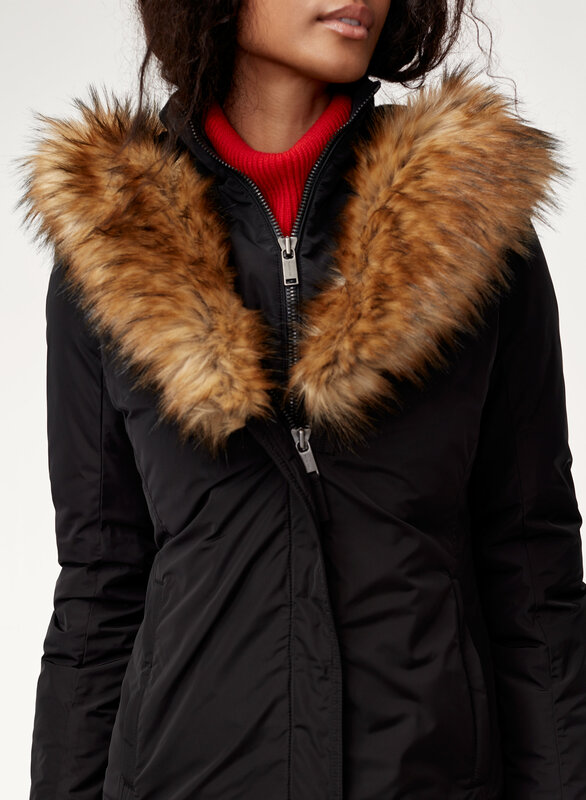 The downsides: a few (2) pockets that are small, the fur is not removable, zips up too high - never zipped it till the end. 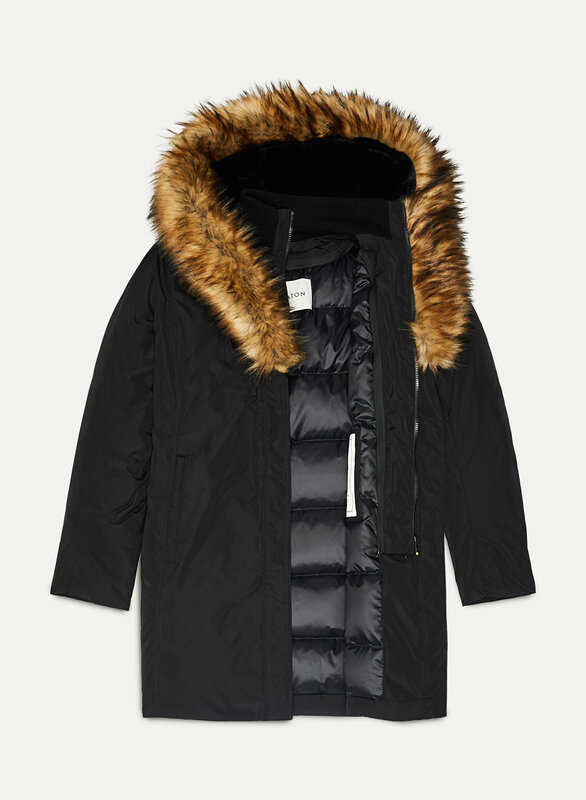 But overall - very good and nice looking parka! I'm between a small and medium and decided to get the small after reading some of the other reviews. It does run a bit smaller than expected. It is snug fitting and doesnt leave much room for a thicker sweater. The fabric is very well made and the length is perfect for someone petite. I was out shoveling our driveway and had some wintery mix rain/freezing rain and I stayed dry. I could literally see rain drops dripping off the jacket, so thank you for making it waterproof. The jacket is warm but I was cold in below zero temperatures (-15degrees), even though the coat is advertised as able to keep you warm to -22 degrees. The bib (inner chest layer and collar) is removable but I wish the fur lining on the hood was removable too. There are times when I prefer to have it off and not be so flashy. Love Babaton parkas. This one is especially warm and the design is so flattering. Fits true to size. -30 days aren’t as bad with this jacket ! Only complain zips up wayy to far. 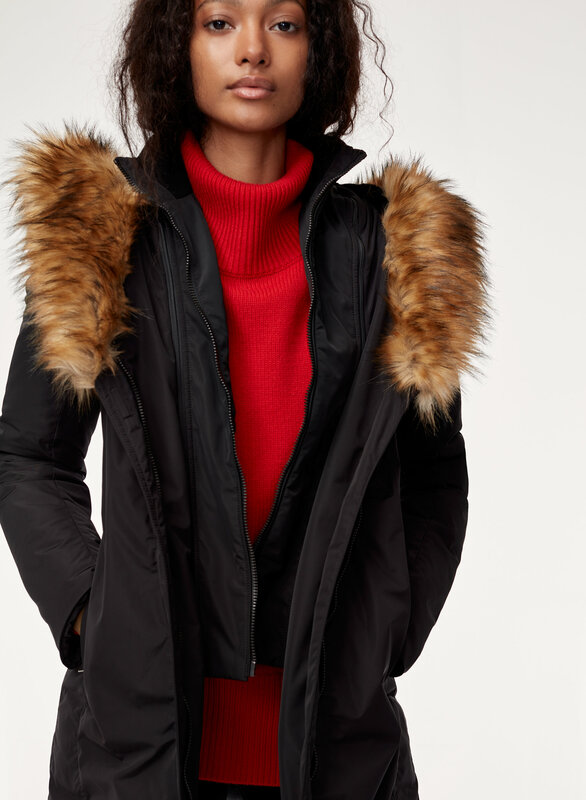 This is my favorite jacket by aritzia it is so warm, and comfortable, the colour and the fake fur trim is beautiful i get compliments all the time! Fits perfectly, it’s very warm and stylish. I live in Ottawa, Canada where average temperature in the winter is -15 to -30 this jacket has been holding up to its promise!!! I get compliments on the regular from total strangers as well. 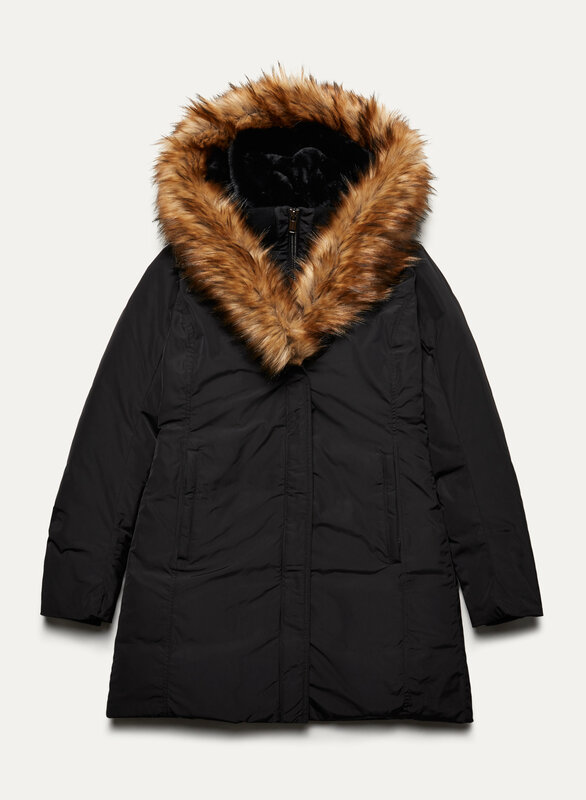 I highly recommend this cozy parka. Just wore this coat in park city at the Sundance film fest. Kept me very warm in sub-zero temps. Only thing missing was an interior pocket!! I absolutely love my parka! I can’t walk up the block without hearing how beautiful my coat is! This coat is very warm. The material is durable, water resistant. The only down side is the coat is very heavy. I am 5ft 3in, 107 lbs. wore this jacket while i was being attacked by a german shepherd and it totally protected me from any bites and scratches. even the jacket lasted in perfect condition. literal lifesaver. so happy i bought this. I love this jacket. Looks classic, keeps me warm, fits like a dream. The photos don't do it justice, but the removable front bib is an amazing feature that changes the warmth and fit of the jacket as needed, depending on your activities, the weather, and the look you like best. Highly recommend this parka! I'm 4'11 so it's hard to find a parka that doesn't look it's taking over my body, but this one is true to size and slim but really warm. The fur is so extra, I love it. Definitely going to be wearing this for a long time. This coat is everything that I need. It fits wonderfully, I love the feel of it, from the outside shell to the inside. My favourite parts are the hood and the vest inside. The hood is super soft and looks great on my head, I find some winter jacket hoods look weird. The vest on the inside is a nice added touch for warmth and I love that it’s a turtle neck. It’s also perfect for where I live (northern Ontario). This coat is amazing.